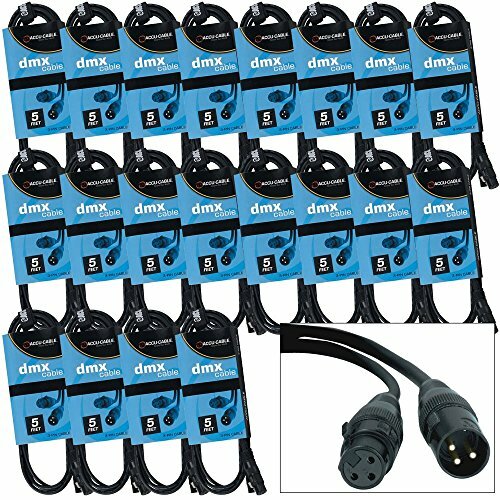 This package inclues (20) 5 foot 3-pin XLR DMX lighting cables. This 5 ft. 3-pin DMX cable is the perfect connection for any of your lighting system needs. You're getting a top-quality DMX-specific lighting cable designed to perform flawlessly and stand up to the rigors of the road. Unlike microphone cables, true DMX-512 cables can handle the high speeds of the latest DMX lighting equipment making your lighting system run at maximum efficiently. If you have any questions about this product by Accu Cable, contact us by completing and submitting the form below. If you are looking for a specif part number, please include it with your message.